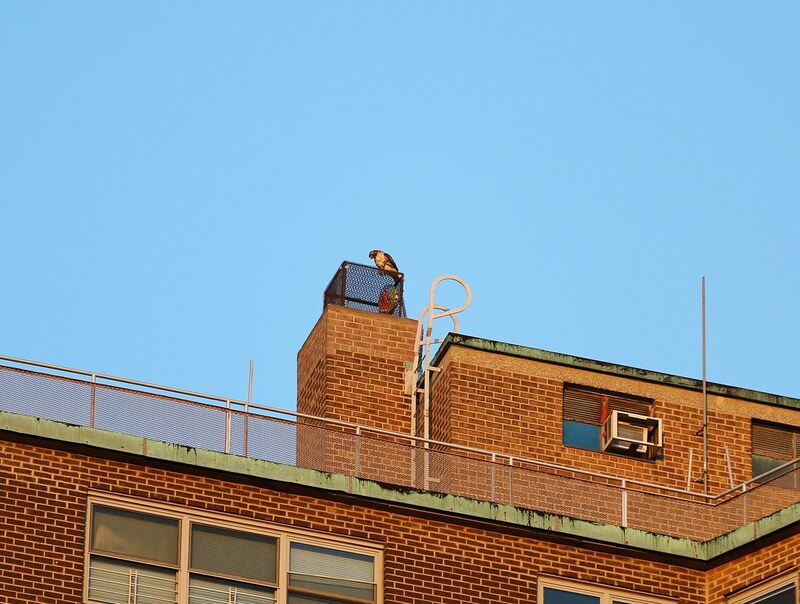 Unlike this time last year, when hawks Christo and Dora spent most of their time in Tompkins Square Park, I've been frequently seeing them perched on the chimneys of the Village View high-rises along First Avenue. Here they are Thursday morning at 4th Street. Christo is on the left, Dora is on the right. 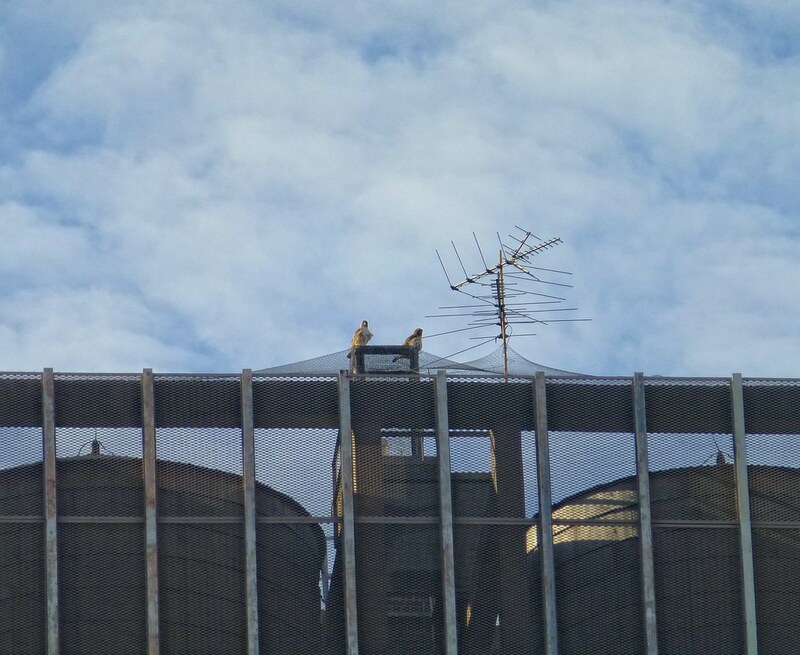 That evening, Christo spent the last couple of hours before sunset patrolling that whole stretch of First Avenue. Here he is at 2nd Street. Notice his feathers are in pretty good shape. 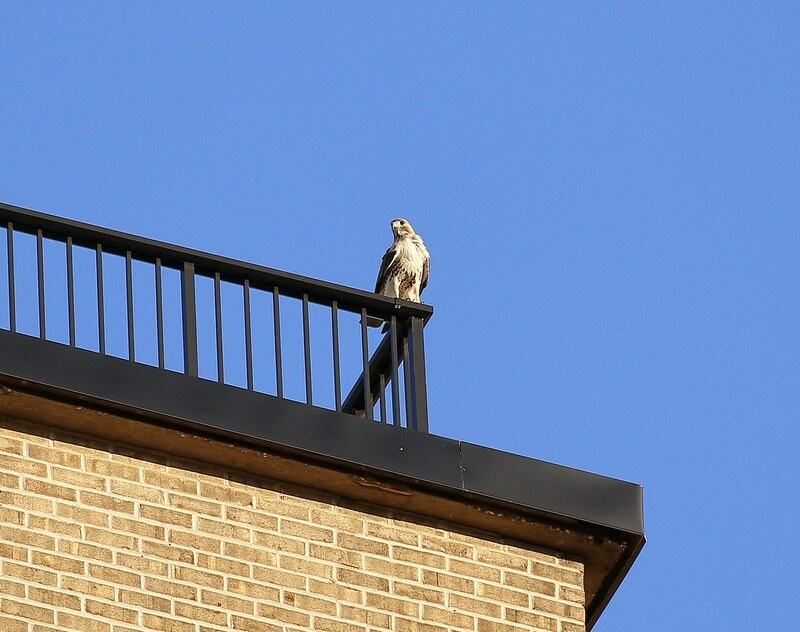 By comparison, this shot of Dora from Sunday shows her wing tips and tail feathers starting to get a little ratty. Here she is inspecting a trapped mylar balloon atop Village View at 6th Street. I was so spoiled last year being able to watch these two go about their business (hunting, mating, stick-gathering, preening, meditating, etc) all within the confines of the park. I could stand in one spot and let the action swirl around me. This time around, it looks like I'm going to have to work! Tonight I chased both birds around the entire neighborhood until sunset. I've not caught them hunting in the last several days, but I'm hoping they continue to use the park as their pantry. 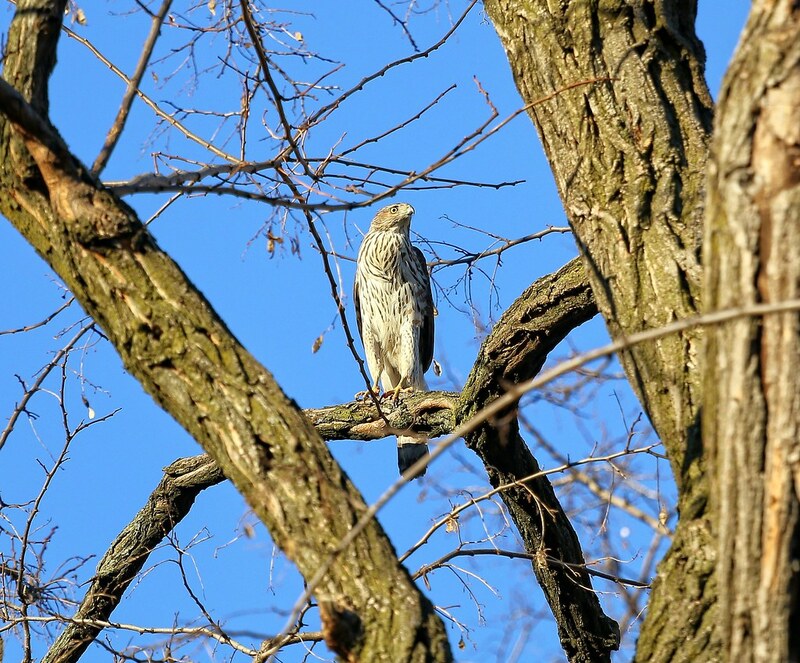 So, after losing track of both red-tails tonight, I stopped over at the Marble Cemetery on 2nd Street to see if I could catch a glimpse of the semi-resident Cooper's hawk. As I watched, the Cooper's stood up and went on alert. 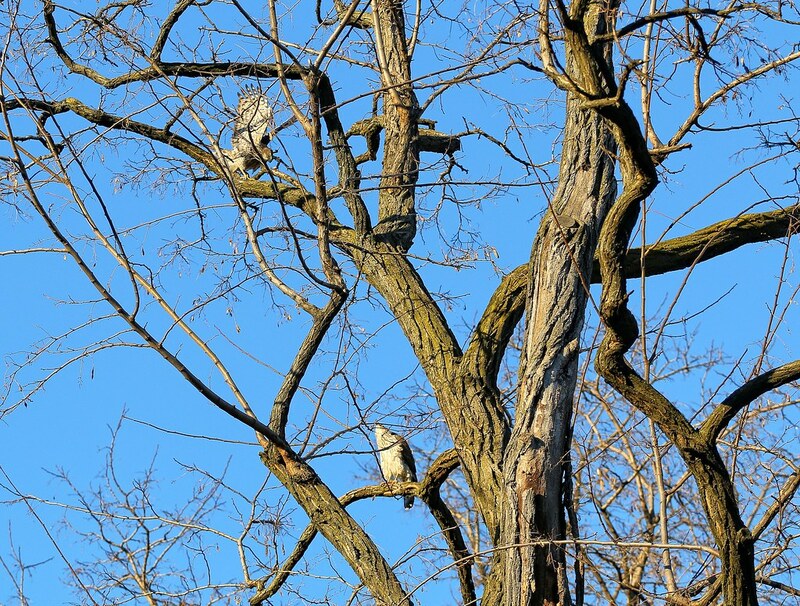 I heard a squeaky chirping sound, so looked up and was excited to see a second Cooper's hawk higher in the tree. The intruder (friend or foe?) hopped down from branch to branch until it got about six feet from the perched hawk. 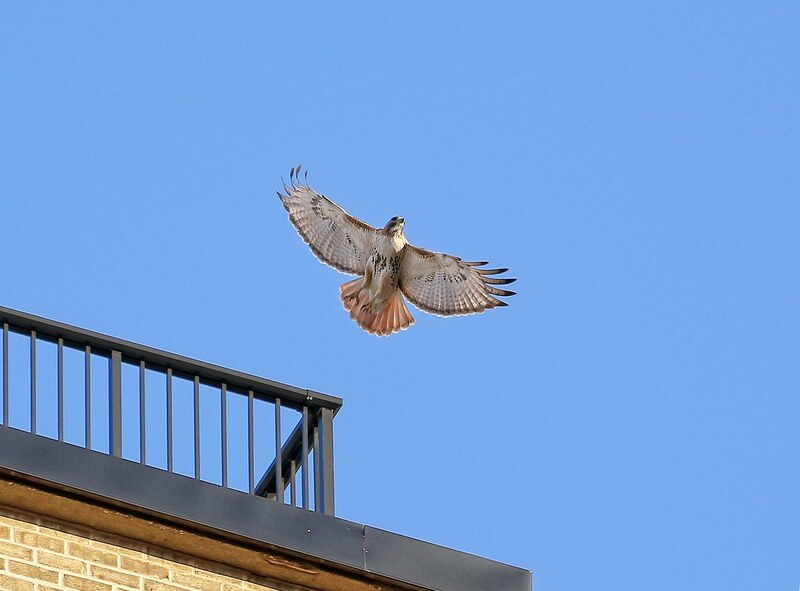 Then it lunged, and the other hawk took off out of the cemetery and flew east on 2nd Street. red tails and coopers - nice! 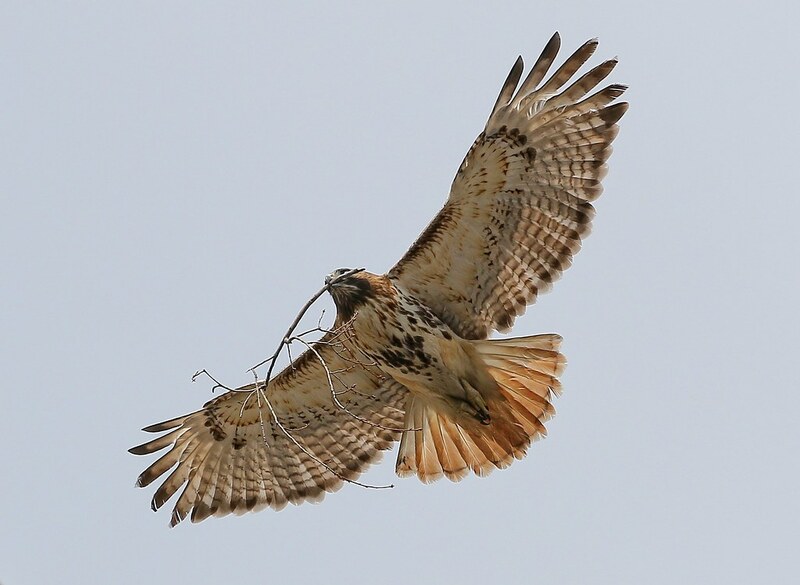 Sunday morning, the red-tailed hawks are busy gathering sticks in Tompkins Square Park, heading south over my building towards the nests. I'm not sure, but one of them seems to have something caught around its leg. Saw it first a few days ago, and thought it was carrying a stick, but saw it again this morning, and it looks like a piece of string. Ugh! Thanks for the update - this is worth investigating. So that's where they were! Haven't seen them much for a few days and now they're back working on the nest even though it's windy. Love the Cooper's shots too.